A contribution of almost $6 million CAD from Irving Ship- to these programs. building Inc. supports COVE in its mandate to grow the Ca- The H2O Conference, June 5-7, 2019, is an event to engage nadian ocean economy by supporting the adoption of innova- with the ocean technology industry in Atlantic Canada and tive ocean technology. This is different from the more general at COVE. The conference will include: an ocean industry role taken by ocean industry trade associations and marketing showcase, international delegates, research, development and sup-port organizations. 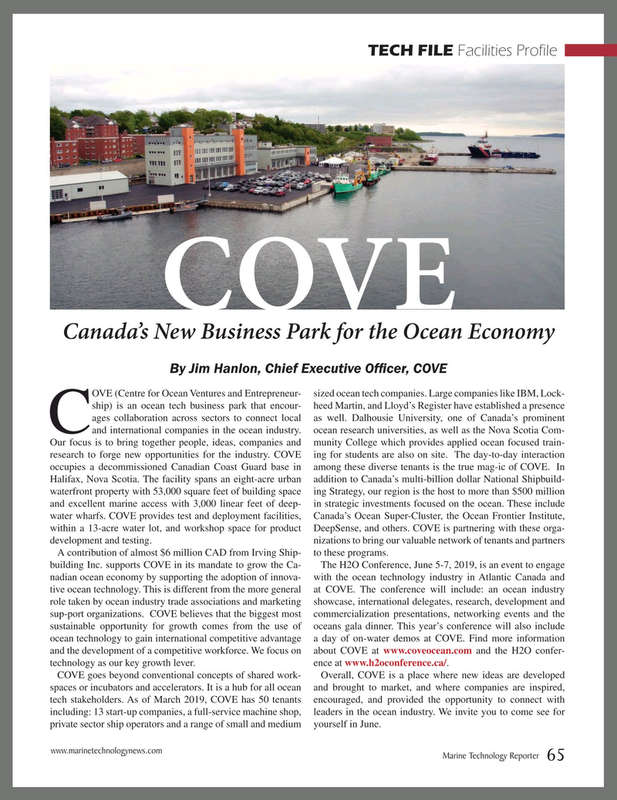 COVE believes that the biggest most commercialization presentations, networking events and the sustainable opportunity for growth comes from the use of oceans gala dinner. This year’s conference will also include ocean technology to gain international competitive advantage a day of on-water demos at COVE. Find more information and the development of a competitive workforce. We focus on about COVE at www.coveocean.com and the H2O confer- technology as our key growth lever. ence at www.h2oconference.ca/.